Get the "Stevie Ray" sound and style with this one. Once you have heard this you can't live without it. NO PEDAL CAN COMPARE! Tolex "aged" Tweed 10" Rotary Wave Speaker- Jenson C10Q, 8 or 16 ohm available. Other speakers available upon request. Only 12" x 12" x 18" tall and 18 lbs. Unit shipped with external foot switch w/speed control and power supply. If you haven't experienced the sound of a spinning speaker, you haven' t experienced one of the most startling audio effects ever invented. Prior to electronic delay line devices, the only way to achieve true chorus and vibrato was by mechanical means. Reminiscent of the old Leslie, the Little Lanilei Rotary Wave Speaker uses the effect known as "Doppler" to achieve it's unique tone as it softly fans the sound waves in a circular motion. 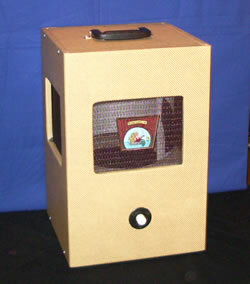 This Little Lanilei Rotary Wave Speaker uses a 10" speaker in a horizontal mount with a spinning cone above . Through the use of a simple control knob, a multitude of different speeds can be achieved, from a slow wave of chorus to a classic "Leslie" warble. You really have to hear it to believe it. The Little Lanilei Rotary Wave Speaker's motor is controlled by a 12vdc power adapter. An optional rechargeable nicad pack is also available. Since the Little Lanilei Rotary Wave Speaker is a non-powered speaker, it may be used with any amp with a speaker output jack. Size: 12" x 12" x 18", weighing in at 16 lbs.